Insert your photos into good-looking army-themed frames. This is an aspiration or inclination for all Indian citizen that he or she grew and will be an Indian army soldier or officer and do hard work to get a position in the Indian military. Everyone childhood dreamed of being a member of the Indian army? Joining the army as a profession is always a dream for every young person. Everyone wishes to serve his country through the army and want peace in his country. Here you can see how you look in these clothes if you purchase these suits from the market. So you can easily get an idea related to those wear clothes or army dress. 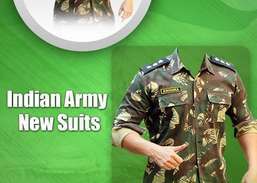 Indian Army Photo Suit Editor - provides a different type of army suits for both male and female with several colors and sizing. 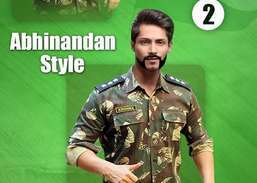 By mean of this Indian army photo editor entertain yourself with family and friends by army suit editor and pick up the best Indian army suit which fits your personality and shows yourself an army man. This application contains all photo suit related to police to wear a clothes. Get Man Suit Photo Maker for free and be the most stylish man ever! Spice your outfits up with this man suit photo editor! Make me vampire with vampire picture editor - vampire camera effects. 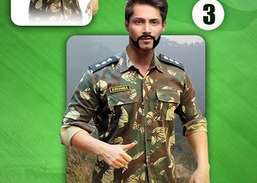 Edit your photo using best Indian Army Photo Suit Editor - Uniform changer.